Forget ExxonMobil and Chevron. The big winner from the recent snap back in oil prices is Transocean. The company's shares are the hottest thing in the stock market this week -- besides Netflix (NFLX), of course. Don't know much about Transocean (RIG)? It's a huge offshore drilling company that you may have heard before because it owned the rig that exploded causing the 2010 Gulf of Mexico oil spill. Transocean stock is up a whopping 13% this week alone. That's the best performance among all S&P 500 energy stocks. 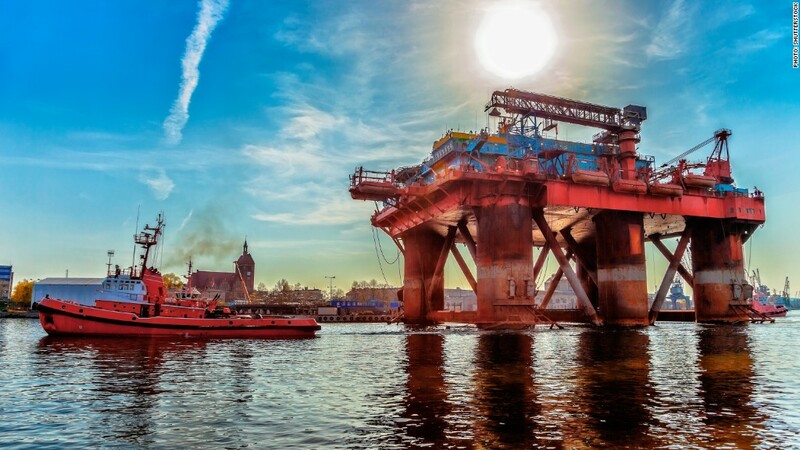 The rally for Transocean and other drilling companies in recent days is a direct result of the huge rebound for crude oil, which has surged 35% since the mid-March lows. Just a few weeks ago some smart people on Wall Street predicted oil could tumble to just $30. Now at least some investors are betting the worst is over for oil. It's closed higher for six consecutive days, with the latest gains coming after a new report showed U.S. oil supplies didn't grow by as much as feared. The price is now over $56 a barrel. Cheering oil higher: While American drivers will greet higher oil prices with sighs, the rebound is great news for most energy companies -- and their shareholders. People who believe oil prices are going to stay hot may instinctively want to buy shares of brand name oil companies like Exxon (XOM) and Royal Dutch Shell (RDSA). However, these energy titans have very diversified business models that protected their stock prices (somewhat) from a crash in oil prices. For example, their refining operations actually benefit from less expensive crude. They didn't go down as much as some other energy companies, so they are unlikely to see as big of a rebound. Drillers make a comeback: The real beneficiaries of higher oil prices are likely to be drilling stocks like Transocean that really crumbled as oil fell over 50% since last summer. Business slowed drastically as big oil companies scrapped expensive projects that were no longer economical. After all, Transocean's deepwater rigs can cost $500,000 to rent -- each day. That's why this group of stocks, led by Transocean and rivals Noble (NBL) and Ensco (ESV), was the worst performer in the entire S&P 500 last year as they cut dividends and abandoned share buyback programs. The damage even caused Transocean to abruptly part ways with Steven Newman, its CEO. Transocean is one of the world's largest providers of deepwater rigs. In 2014, a judge ruled that Transocean was negligent in the Gulf of Mexico disaster that caused the death of 11 workers and the spilling of nearly 5 million barrels of oil. Time to buy? If oil prices keep rallying, look for Transocean to follow it higher. While the stock surged above $18 this week, it's still a shell of its former self. As existing Transocean shareholders know, it's still down 60% from its 52-week high of $46.12 -- the most out of any S&P 500 stock. The good news is that means it may have a lot more room to run. Earlier this week Morgan Stanley said it's "calling the bottom" for oilfield services stocks like Transocean. These stocks have enjoyed a multi-month rally at this point in previous cycles, the firm said. "We believe that now is a good time to build or increase a position in oil services stocks," Morgan Stanley analyst Ole Slorer wrote in a report. The firm said these stocks could soar by 30% to 40% if commodity prices improve, but they only face 10% to 15% of downside if oil retreats. "Based on what we have seen in prior cycles, these characteristics translate into a very attractive risk reward," Slorer wrote.